e-Book, PDF format, watermarked, 177 colour illustrations. The Berlin fashion magazine STYL – Blätter für die angenehmen Dinge des Lebens (published from 1922 until 1924) exemplifies the peerless Twenties, and is, therefore, an important document of the times. This period style – which coincided with the silent film era, the Bauhaus and the “Roaring Twenties” in the US – is today one of the most important sources of inspiration drawn on by contemporary designers. The ideas of the day on an elegant lifestyle and social change, including the new idea of women’s roles (sport, professions and careers, self-determined eroticism) were all discussed in STYL. Illustrations by such luminaries of the day as Anni Offterdinger, Lieselotte Friedländer, Kenan, Ludwig Kainer and Emil Orlik illustrate a paradigm shift in the female image during the interwar years. Typographically adventurous advertising in STYL displays a panorama of luxury consumerism and the diversity of products typical of the time. 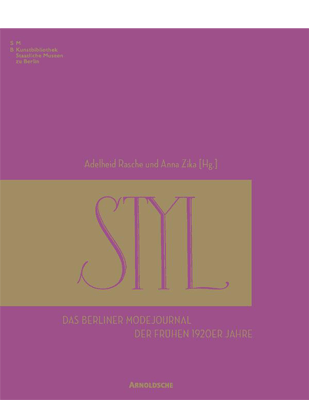 The Design Department at Fachhochschule Bielefeld has systematically studied STYL (from the issues kept at the Berlin Kunstbibliothek) from the angle of the (Berlin) fashion presented, graphic design and the magazine’s agenda. The present illustrated book with accompanying text showcases the magazine’s profile with original double pages reproduced, scholarly essays and comprehensive annotation and references. Dip into the glamorous world of 1920s Berlin. A colourful kaleidoscope of fashion, society and gossip – featuring completely new graphic design.